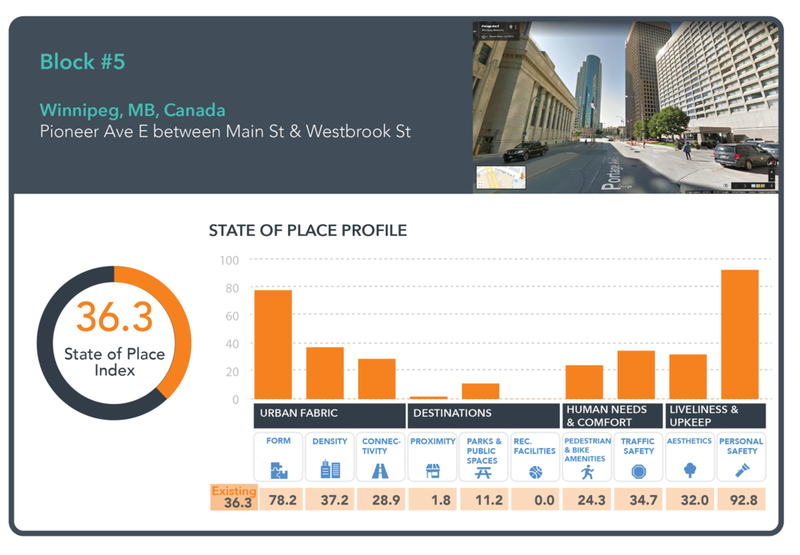 A year ago, our CTO Andy Likuski, went to the IDA (International Downtown Association) conference in Winnipeg, and because he’s a consummate place lover and data geek, decided to do some local data collection on a contested intersection - Portage and Main - to quantify its dismal, anti-pedestrian state and more importantly, to show how remaking it into a people-first place would pay off in spades. Well, turns out that Winnipeg has since put the question of whether to reopen the intersection to pedestrian traffic up for a vote. Come October 24th, Winnipeggers will have the opportunity to vote for progress, and go the way of most cities who understand that walkability is now a need-to-have, or remain stagnant and pave the way for continued auto-dominance. But there’s no need to take us at our word alone…given the news of the upcoming vote (and the fact that I just spoke about the case of Portage & Main in my keynote calling for more data-driven citymaking), we thought it was the perfect time to reprise and update last year’s blog, which includes a data-driven, evidence-based report showcasing how prioritizing place isn’t just good for people’s hearts and souls, it’s good for people’s pockets too - at a tune of 18X ROI. You can also check out the radio interview our CEO did last year with Global News Radio 680 (go to Sept Sep 13 2017 4pm-38min) about our study and press coverage of it in the Winnipeg Free Press. Jul 2017: Hmmm... looks like that Dillon $116K study won’t get released? Oct 2017: Actually, the city releases the Dillon ($134K) study! Oct 2018: In the meantime, City hires consultant to redesign *underground passing! Are you keeping track? So that's five years, at least $116K and counting (more if you count lost time) with no end in sight... all to decide whether or not to take down some pedestrian barriers? Really? Seriously? It's 2018. This. Shouldn't. Take. This. Long. To be fair, this Winnipeg War is all too common. There are countless plans for making places better that should just be no brainers. We all know what inherently good design is. We all know what is good for pedestrians. We all know what more and more people are looking for - walkable, livable places. And there are many amazing designers and planners equipped to create awesome schemes to make these kinds of places come to life. And yet...five years and counting and nothing. And that's not even the worst case scenario. Some plans don't see the light of day for over a decade...hence all that "notorious" dust being collected. Why? The truth of the matter is, there are still stakeholders that don't buy your vision. And they're often equipped with "data" that proves their point. And you're bringing (beautiful) pictures to fight your battle (and in the case of Winnipeg, they don’t even have that). It's time to fight fire with fire. It's time to bring your own gun to the gunfight, as one of our favorite customers, and big-time IDAer, Raphael Clemente of West Palm Beach Downtown Development Authority loves to say. It's time to create your own "data-driven" story about the power of place. So without further ado, we've taken the liberty of doing just that. We analyzed the existing conditions of Portage and Main and the five blocks that intersect it and ran a scenario analysis to see what the impact would be of transforming this uber car-oriented street into a pedestrian wonderland - both in terms of quality of place and the economic bottom line. TL;DR - the results are AMAZING!! Build it so they can walk - and make $$$ while at it! We're not trying to toot our own horn (too much! ), but the analysis below took a matter of hours to put together, and most of that was spent collecting data for the six blocks included in our report (and soon, we'll automate that so it'll be done in seconds). Compare that to five years and potentially two more years to go...Save time and money and maximize the bang for your buck (ahem, estimated at $18+ ROI) - who doesn't want to do that? Ran a Sim-City style analysis that projects the new State of Place Index if the City were to open up the intersection to pedestrians (which would impact the score for four blocks!) and make a few other changes (contact us to find out what other goodies we added to increase the score!). Here's a peek at all the potential changes you could make. Create a Return on Investment of $18.07 for every dollar spent - which means, all those other ways to “use” this money, well opening portage and main to pedestrians could help fund that and way more! Created a (free, downloadable) report (with all this info) for you to bring to the "fight." You're welcome Mayor Bowman and Vote Open Portage & Main. Good luck on Oct 24th and get in touch if you need help before then! 1) Schedule a demo with us! 2) Sign up for a free trial. 3) Download this report below. Get Your Free State of Place Trial! Newer PostHelp Us Help You Get to Zero! Older PostIs Mommy-friendability the new Walkability?